Despite the fact that Michael Cera's character Nick Twisp originally appeared on the page in a novel by C.D. Payne, onscreen Twisp gives off the distinct impression that he could've been an escaped survivor of the cutting room floor who fled from the editing rooms used for the films Igby Goes Down, Rushmore and/or Charlie Bartlett only to wind up in this movie. 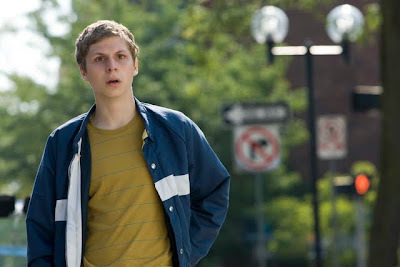 With Cera in the role there's a tendency to compare Twisp with other far similar contemplative, wise-beyond-his-years characters he's portrayed in Juno or Nick and Norah's Infinite Playlist. And in Miguel Arteta's odd but appealing venture, once again we find him embracing comparable terrain as an analytical and artsy eighteen year old Oakland, California high school student who prefers Fellini, Sinatra, and classical prose over all things commercially or stereotypically “teen” with one monumental exception regarding his obsession with losing his virginity. We quickly gather that he's tired of feeling like the odd man out thanks largely to the admittedly trashy and lascivious preoccupations of his promiscuous divorced parents Steve Buscemi and Jean Smart. However, “nice guy” Twisp believes things are starting to look up at last when he meets the beautiful and equally precocious French New Wave obsessed Sherri Saunders (Portia Doubleday) while spend a week hiding out from violent sailors his mother's boyfriend (Zach Galifianakis) ripped off under the guise of taking a normal family vacation. Fearful that nice guys only finish first in the movies and in real life the earnest, soft-spoken guys never get the girl let alone seal the deal, Nick takes inspiration from posters of Breathless actor Jean-Paul Belmondo displayed in Sherri's bedroom by creating a French mustache fetishizing, cigarette smoking doppelganger who urges Nick on into doing whatever it takes to be with her. While it's a hoot to see Cera as the arson starting, morally bankrupt, personally manipulative schemer try to break away and try something a bit different than his typecast role as the teenage adorable neurotic a la Generation Y's cuter version of Woody Allen, it's never fully utilized to its full potential in the brisk ninety minute running time of the film. Bringing in ample but again under appreciated supporting players such as Ray Liotta, Fred Willard and Justin Long who – aside from a few choice moments with Long – are mainly wasted in the roughly cut together finished product. Overall and aside from the entertainingly original premise Youth in Revolt feels like it's leaving the viewer a bit pushed to the side emotionally by avoiding the natural complexity of situations in favor of band-aid like quick fixes to outrageous situations. All in all, it's a definite step in the right direction for Cera who really needs to begin moving beyond these teen angst filled comedic love stories to explore his potential as an understated comedic actor in his own right. And while Revolt may not be quite as sharply funny as the films to which I compared the work at the beginning of the review, it's still much better than the commercially slick Hollywoodized coming-of-age movies like American Pie which also deal with a burgeoning adult's rite of sexual passage.